The Normans spread to England, Sicily and parts of Italy as mounted warriors, known for their long mail hauberks, kite shields and conical helmets. 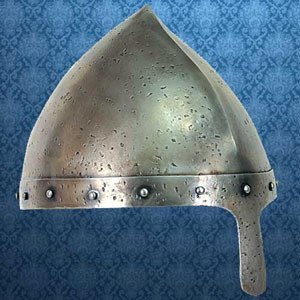 This type of slightly curving, forward peaked helmet is the second most recognized form. The conical shape allows blows to slide off while the face was provided some protection with the nasal piece which still allowed great vision. This helmet has a handsome aged finish with an adjustable liner.